Nancy Forrester with two of her parrots (ARA is the Blue + Gold Macaw and LARRYBIRD is a Harlequin Macaw, a hybrid produced by crossing a Blue and Gold Macaw with a Green-Winged Macaw. 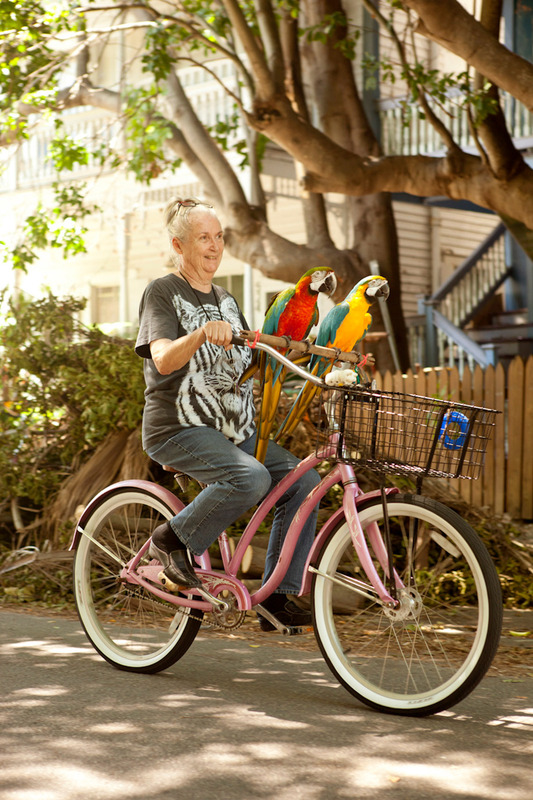 Nancy Forrester is a Key West local who runs a hidden gem called "Nancy Forrester's Secret Garden" housing a number of rare parrots and macaws and orchids. She is photographed here on her bike outside her home/secret garden. For more information contact Nancy Forrester at 305-294-0015 / visit her website at http://www.nancyforrester.com).